Here at Finance MD, I advocate investing and smart spending. However, the reason why we have to manage our finances wisely is to ultimately enjoy the fruits of our labor. One good way to spend your labor’s fruits is to buy some really cool high quality brand name shoes. It would be nice if you can customize and personalize them too. If you read further, there’s an arbitrage opportunity in these shoes somehow. 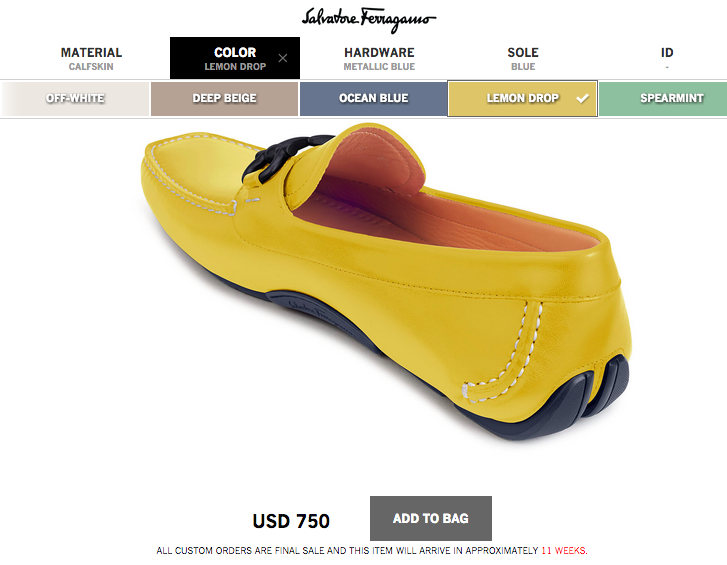 Here’s my own customized, personalized Salvatore Ferragamo shoe – that I don’t plan to buy yet. Want to create your own customized, personalized Ferragamo driver shoes? The best part is you don’t actually need to buy it, if you don’t want to. Here’s how! You will first choose the material for your shoes. The price and time of delivery will depend on this. Crocodile will cost you USD 2,400 and will take 13 weeks to arrive. Ostrich is at USD 2,000 and will take 12 weeks. Both suede and calfskin cost USD 750 and will take 11 weeks. The calfskin and suede options are the only realistic options for me price-wise. The next step is to choose the color. Calfskin and suede offer the most color choices (ten). Croc is available in six, while ostrich is available in six. The next step is to choose the hardware. Some colors offer more choices of hardware. The next step is to get the sole. Unfortunately, given your choice of material, color and hardware, the sole choice is made by the system for you. The sole looks cool by the way. The last step in customizing your shoe is adding your name on it. You can use your real name or you can put your domain name like me. Sadly, only letters and the period symbol are allowed, so twitter handles or hashtags aren’t possible. You can be as formal or as douchey as you like with your twenty-character limit. 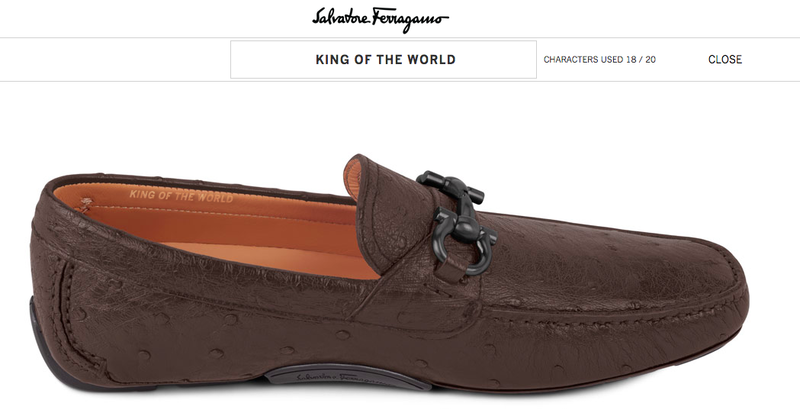 What more annoying way to announce that you’re rich or you’ve been successful in the financial markets than by inscribing “King of the world” in your customized Ferrgamo ostrich shoes? Fun Fact: Leonardo played two famous self-proclaimed “King of the world” roles. Jack Dawson in Titanic (1997) and Jordan Belfort in The Wolf of Wall Street (2013). Read a previous blog post of mine featuring The Wolf of Wall Street here. That post tackled so-called “investment pieces”. I think these customized shoes qualify as “investment pieces”. First, the shoes will probably last you a very long time. Second, they’re a good way to enjoy the fruits of your investments. I’m not ready to splurge on these shoes yet. However, I see an arbitrage opportunity here actually. Read about arbitrage here. 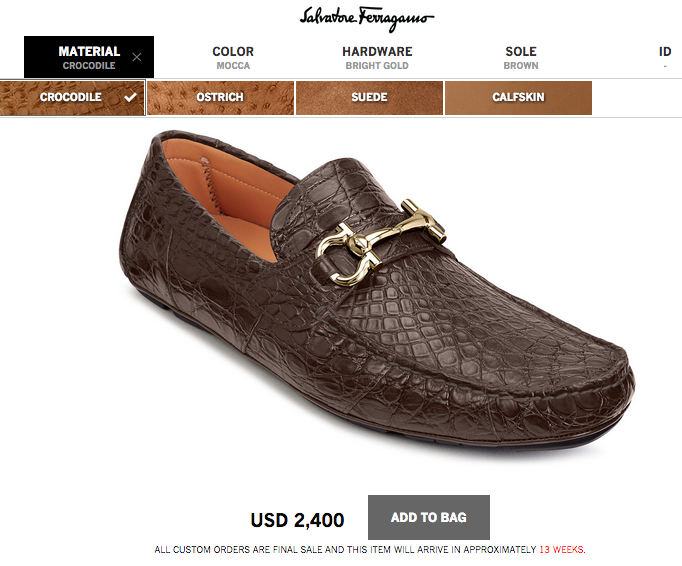 The calfskin and suede shoes from the European website (Italia – where the shoes are actually made and where Ferragamo is based) costs only EUR 550 as compared to USD 750 in the United States Ferragamo website. 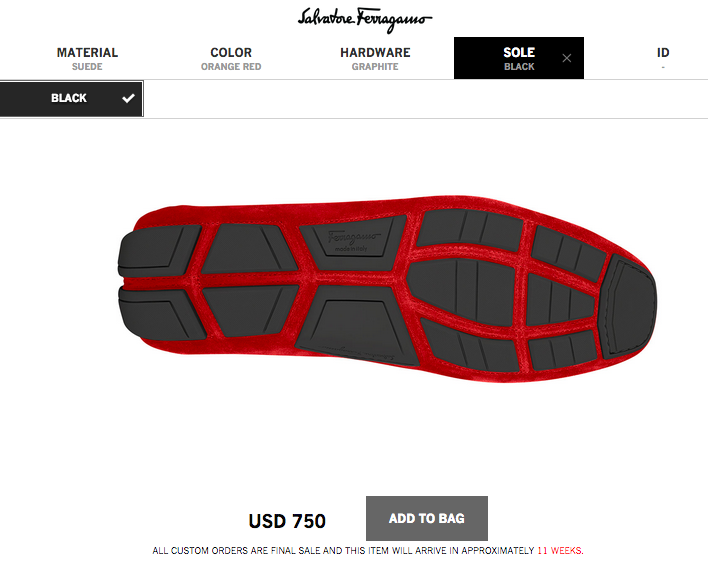 By current exchange rates (as of 8/1/2015), the shoe should cost only around USD 605. By buying the shoe in Euros, you’ll save in the ballpark of 20%. If I decide to buy these shoes, I’ll be buying them in an advantageous currency they’re available in. Right now it is the Euro. Arbitrage shoes? See? There’s another reason why these shoes are “investment” pieces – and they have my name on them. Previous Previous post: CFA Level I and II 2015 Exam Results Are Out! Next Next post: Do New MLMs Just Reuse and Rebrand Products of Failed MLMs?